This write-in book contains four new extended practice tests that help students prepare confidently in the weeks before the Cambridge IGCSE English as a Second Language exam. By completing the tests, learners develop familiarity with the format of the assessment and enhance their reading, writing, speaking and listening technique. With answers at the back of the book, this resource is perfect for learners’ self-study or for teachers to save time when marking. 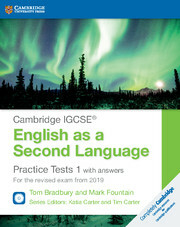 Audio for the listening exercises is on the accompanying CDs or online at cambridge.org/education/igcse-esl-tests. This ‘with answers’ edition includes graded sample answers with examiner comments that help students understand what is required of them in the exam. With answers at the back, this book is ideal for teachers or for students’ self-study.